It is perhaps an irony of fame that those whose passage through an institution was of sufficient duration that their personality was able to impose some surviving stamp on it are remembered by posterity as much for their negative effects as for any positive contributions that they may have made; on the other hand, the oblivion of history erases memories of any negative effects of lesser mortals, even at the cost also of erasing those of any positive contributions that they may have had. Some may argue against this cynical view of institutional history but what is less disputable is that certain individuals do leave a longer-term legacy, albeit that sociologists have been suspicious of what, in the days before any gender sensitivity in the use of language, was labelled ‘the Great Man theory of history’. Their alternative view is that historical trajectories are determined by far more than the contributions of particular individuals; if that were not the case, a major raison d’être of their subject would evaporate. 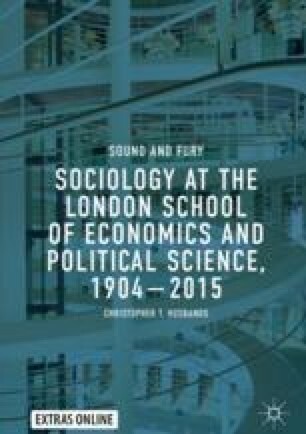 Even so, it is incontestable that individuals in strategic positions in an institution may have some determining effect upon its current ambience and its historical development and the three individuals to whom this chapter is devoted were hugely influential, probably more so than any others, in shaping LSE Sociology; that alone justifies the status afforded to them by the chapter’s specific focus on them. William Shakespeare, Julius Caesar, Act 3, Scene 2, lines 75–6.